Hopsters, a brew-your-own beer establishment and bar in Newton, has begun distributing its own branded brews. 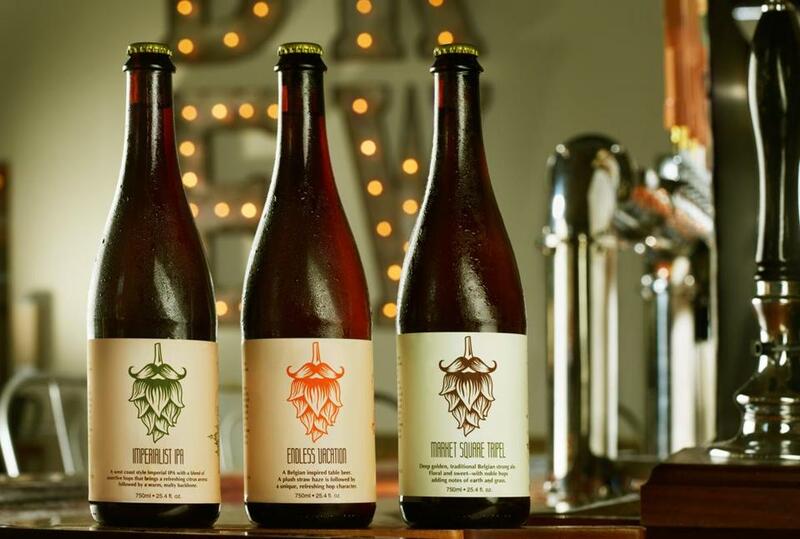 Hopsters has signed on with the Craft Brewers Guild to distribute three flagship beers. A week ago, the brewery sent out its first commercial release, with 75 cases going out to bottle shops around the area. The beers — Endless Vacation, Market Square Tripel, and Imperialist IPA — will be brewed and sent out weekly, according to head brewer Jeff Rowe. Hopsters isn’t alone in the brew-on-premises movement. Barleycorn’s, in Natick, has been doing it since 1998. Hopsters owner Lee Cooper is trying to flip the model on its head. Rather than simply providing a space to brew your beer, only to watch you leave after a couple of hours, Hopsters wants you to stay. The bar has 20 taps, 10 featuring house beer and 10 from local brewers. It’s a hangout as much as it is a space to make an IPA on a company outing. Distributing beer to the public is another part of that evolving identity. To that end, Cooper hired Rowe, a veteran of Cape Cod Beer with seven years of brewing experience, who’s currently charged with overseeing a diverse operation. The three flagship beers Rowe and Cooper have chosen to showcase are both surprising and predictable. It’s no big shock they’d select a double-IPA, and a Belgian Tripel isn’t a revelation. What I was particularly excited about, in a beery, nerdy way, was the Endless Vacation, a Belgian table beer. I’m always curious as to how a brewery makes a low-alcohol beer interesting, and at 4 percent alcohol by volume, this was a good test case. Endless Vacation pours a translucent white into a tulip glass. It smells of lemon and hay. The beer is light on the tongue, more bready than spicy, with a slight hop bitterness that fades before you have time to think about it. The aftertaste is almost not of beer, criminally smooth. This one is easy to drink, good to have around the house if you need a little extra push to get the leaves raked. Market Square Tripel is more noticeable, a bigger beer (9.4 percent ABV) with bigger aspirations. It pours darker and drinks much thicker than Vacation. “We wanted to come out swinging in both range and quality,” says Howe. It’s sweet, and not quite as spicy as I’d like it to be, but it’s not a bad beer. With some drying out, it could be even better. The last beer, the IPA, shouldn’t be a tough sell. It checks in at 7.6 percent ABV, and pours a soupy chestnut-orange. There are bright, floral, effervescent IPAs everywhere; this is not one. Imperialist IPA is bitter, listed at 130 international bitterness units. The human tongue stops detecting such things after about 100. This reminds me of West Coast IPAs from stalwarts like Stone, but with fewer aromatics. For something bottled only a week ago, I was hoping for more smelly stuff. When we last talked, almost a year ago, Cooper was happy with the Newton space, but said he hoped to be closer to the city. Cooper says he’s in negotiations with a landlord in the Seaport area on a 12,000 square-foot space that would allow for a full-scale, 20-barrel (a barrel is 31 gallons) commercial brewery. He hopes for a space that will allow for a four-season beer garden. A new brewery would join Harpoon and Trillium in a burgeoning beer neighborhood.